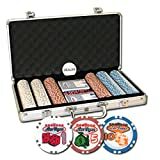 welcome | Buy Poker Chips Sets at the best prices! This elegant set includes high quality clay 9 gram chips with “Welcome Las Vegas” design as shown. Actual Las Vegas casino chips weigh between 9 to 10 grams. These chips do not have a metal insert and feel and sound like real casino chips. Each set includes a heavy duty aluminum case, 2 decks of cards, 5 dice, and 500 chips. Chip colors are: 200 White, 150 Red, 150 Blue.